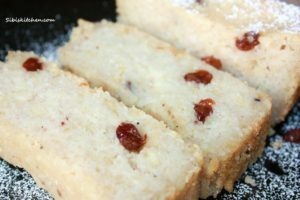 A mouth watering sweet bread made from cassava or yuca. How did I get to taste this Caribbean dessert ? Thanks to Alimas Roti . 2.Blend all the ingredients except raisins together in a food processor. 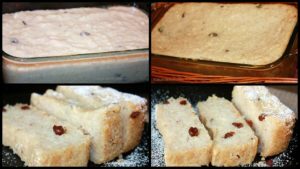 3.Pour the mixture with raisins into a greased bread pan and bake for 30 to 45 minutes until medium brown. 4.Let the baked pone cool to room temperature. 5.Slice them into rectangular pieces and serve.